BELIZE CITY, Mon. Aug. 31, 2015–Except for a season opening 5-1 loss by BDF to the young Wagiya squad in Independence, all the games had been very close in this PLB Opening Season 2015-2016, which marks the start of the race to next year’s Champions League. BDF had some problems late in last season’s playoffs, where they had suffered 6-0 and 5-1 bombings from Verdes, so maybe they still had things to iron out. But they were quickly back to form with a 1-1 draw last week against the defending champions, Verdes; while former champions Belmopan Bandits had drawn 0-0 with arch rival Police United and stopped the upstart Wagiya, 2-1. 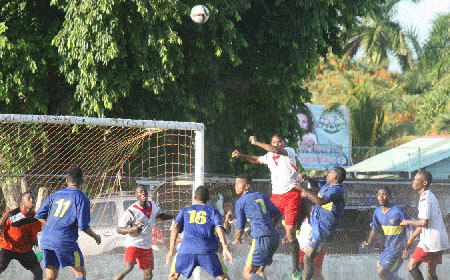 Verdes had also been held to a 1-1 draw in their opening game against Placencia Assassins. So, as the competition got into full gear, nobody was expecting a lopsided score in Week 3, and least of all to the Bandits; but that is what happened yesterday in San Ignacio, where they were thrashed, 6-1, by Verdes. Going into Week 3, the trend continued with another close encounter on Saturday night in Independence, where the young Wagiya squad came from behind twice to secure a 2-2 draw against the visiting power house, Police United FC, at the Michael Ashcroft Stadium. Harrison “Cafu” Roches (41’ & 73’) put Police in front twice, but each time Wagiya came back to tie the score, first through Eugene Martinez (54’) and then it was a late strike from Erwin Middleton (83’) to knot things up for the 2-2 final score. Here at the MCC Grounds on Sunday afternoon, things were just as tight, as Placencia Assassins struck early in the southern goal, through Alexander “Pleck” Peters (2’), who got free inside the eighteen on the left wing and unleashed a rocket from close range that caromed off the hand of BDF goalkeeper Tevin Gamboa and into the top of the net for the early 1-nil lead. But before the half ended, BDF got the equalizer when Osmar Duran’s center from near the left flag pole found midfielder Michael Martinez, who re-directed the ball backwards with his head, sending it into the right top corner, out of reach of a diving Elias Pelayo in goal for Placencia; 1-1 ball game. And it stayed that way till the end. The MCC game was originally scheduled for 3:00 p.m., but the start time was appropriately adjusted to 3:30 p.m., the traditional start time in the days before there were ever lights on the MCC. By the time long whistle was blown to end the action at the MCC, reports received indicated that the game was also close at the Norman Broaster, where the monster match-up between Verdes FC and the Belmopan Bandits was scheduled to start at 4:00 p.m. Latest word was that Verdes was up, 2-1. But nothing could have prepared us for the news today from the PLB Week 3 games report, when we saw the final score, Verdes over Bandits, 6 to 1. The Bandits had jumped out to a 1-nil first half lead through Elroy Smith (27’), recently returned from a ten-year stint in Honduras, to replace former Bandits sweeper and fellow national team player Dalton Eiley, who had returned to his home town team, Placencia Assassins. But it was all Verdes after that. Deon McCaulay (41’, 76’ & 91) equalized before the half on his way to a hat trick for Verdes, who also got goals from Brazilians Alcides “Paco” Thomas (51’) and Yoras Silva (79’), as well as from Mexican Jesus Patino (84’), for the 6-1 final score. There are rumors of a Bandits protest, but we have received no official word yet from the PLB Secretariat. The PLB Opening Season takes a break this coming weekend, as the national team travels tomorrow, Tuesday, for World Cup 2018 qualifier against Canada in Toronto on Friday; and the return match takes place at the FFB Stadium next week Tuesday, September 8.